Researchers at the Los Alamos National Laboratory have discovered unique characteristics in nanocomposite oxide ceramics that hold promise for nuclear fuels, fast ion conductors, ferroelectrics, and for storage of nuclear waste. Composites can be used for a wide range of applications, as their interfaces possess distinctive ionic and electronic properties that may help improve conductivity of materials. The properties of nanocomposite oxide ceramics, as well as their structure, and potential applications have created interest among researchers. The project’s principal researcher from Los Alamos National Laboratory, Pratik Dholabhai, stated that the interfaces between the various crystalline regions of the material decide its electrical, radiation and transport properties. Further, the tolerance properties of the interfaces against fast ion conduction and radiation damage could be enhanced. Composites can help improve the thermal conductivity of nuclear fuel. This property decides efficient energy extraction from fuel. The researchers at Los Alamos National Laboratory studied the interface between Strontium titanate (SrTiO3) and Magnesium oxide (MgO). 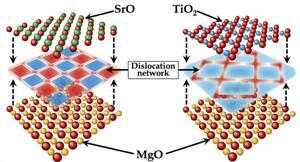 At the SrTiO3/MgO heterointerfaces they found a powerful dependence on the termination chemistry. Alternating planes of TiO2 and SrO make up the SrTiO3 material. The TiO2- and SrO- terminated interfaces were found to have surprisingly different atomic structures. Misfit dislocations characterize these types of structures. These dislocations occur when the different materials vary in size and affect the interface’s conductivity and other properties. Controlling the interface termination chemistry of oxide nanocomposites will help tailor their damage resistance to radiation, and transport properties. The lead researcher of the study, Blas Uberuaga, stated that property of sensitivity of nanocomposite oxides’ interface structure to the interface’s chemistry holds promise for new research.